The alloy, under the trade name Haines 188 or Haynes®188, is classified as a material based on a unique combination of the beneficial properties of nickel and chromium. Not the least role in this alloy is cobalt, which increases thermal endurance and a number of other useful qualities. A successful balanced combination of chromic and nickel fractions with cobalt, as well as the presence of an optimal amount of alloying additives, can significantly increase the operating temperature of the material. The temperature index of the zone of operation of equipment made from a raw material of this type can reach 1100 degrees, without loss of performance and mechanical properties of products. In addition to significant heat resistance, the alloy Haines 188 is characterized by increased resistance to corrosion damage under the influence of an aggressive industrial environment. 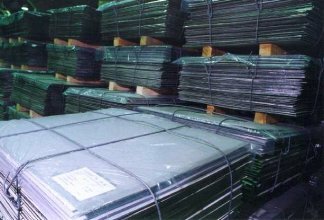 The chemical composition of the alloy is of decisive importance for the working parameters of the alloy. The optimal ratio of the main elements of filling the material allows it to be used in special conditions that are characterized by a high complexity of equipment operation in the presence of numerous negative factors contributing to the rapid destruction and wear of the working parts of industrial equipment. Due to its high working quality, Haines 188 is actively used in various industries of the modern industry with the most difficult working conditions for the manufacture of critical equipment. Due to their considerable resistance to the sulfonation process, such an alloy can be used to manufacture the components of a gas turbine engine, flame detectors of combustion chambers or transition elements for gas pipelines. A wide range of product names and a diverse assortment of semi-finished products, represented by pipes, sheet products, circles of various sections, wire and other semi-finished products, simplifies the choice of a method for solving engineering problems of any complexity. A wide range of products from nickel steels is offered on the site of OOO «_" High quality of products and absence of intermediaries determine the most profitable offers for the purchase of products from the alloy Haines 188 for solving current production problems Delivery in the shortest time in any region of the country and abroad, compliance with the normative documentation of products has long won the trust of loyal customers. Due to the high performance and a wide model range of semi-finished, 188 Haynes enjoys continued population polarity in all areas of production.